More meets Christians where they’re at, acknowledging the roots of their discontent and demonstrating how to move from inspiration and desire into action. Introducing a memorable vocabulary and an easy-to-use practical framework, More equips readers to embark on a journey of discovering their unique personal calling. *Available in print, Kindle, and audio formats. Most people are not living in the sweet spot of their unique personal calling. Instead, they live continually with a tension, sensing that God has something more for them than what their journey currently offers. More helps people turn this discontent and their questions regarding purpose and significance into meaningful action. 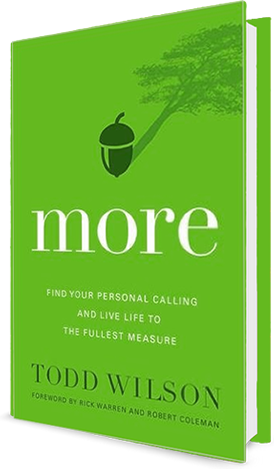 More provides a memorable vocabulary and a practical framework that are easy for any person to use in embarking on a journey of discovering their unique personal calling and making progress in answering the nagging questions of purpose that we all face. More will help you find your unique personal calling! More starts with who we are, and that we are uniquely created with a unique identity and design. Who are we created to BE? This identity is one we actively discover and participate in activating. Our BE or identity overflows into and shapes our mission. What are we made to DO? Finally, our DO requires a context, or a position where it is lived out. Where are we to GO? More is full of insights and tools for working through these BE-DO-GO elements. All of these working together lead to the fullness of God’s call on our lives. 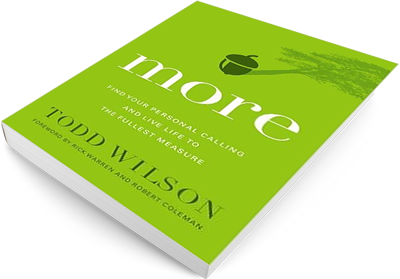 Rick Warren, author of The Purpose Driven Life, Dr. Robert Coleman, author of The Master Plan of Evangelism, and Bob Buford, author of Halftime have been strong voices into Todd Wilson's life and the book More. These leaders contributed to More by writing the Foreword and Epilogue. 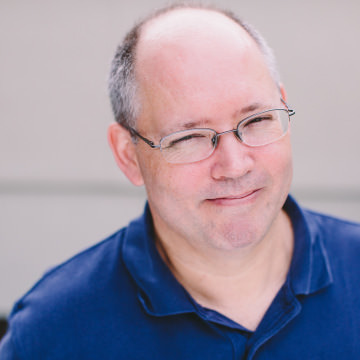 "I have walked with Todd Wilson and been part of his team at Exponential for several years. He cares deeply about Jesus and the church. He is a student and lifelong learner. His passion for living for God’s glory and helping others do the same is genuine. I’m proud of how he has used the gifts God gave him, and I encourage you to learn from his experience." "I am honored to have played a part in Todd’s journey and the writing of More. When you spend time with Todd, you can’t help but see his passion or the Kingdom of God and his heart for multiplication. 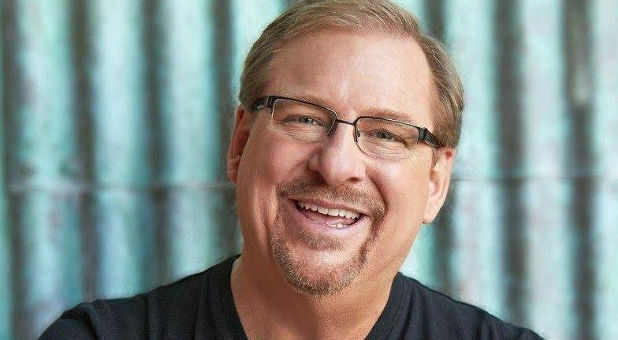 Todd is giving his life to modeling what it looks like to live in your unique sweet spot of personal calling and to equip others to do the same." 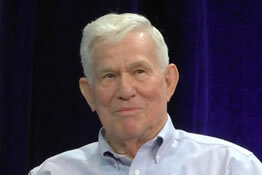 “What Todd has done in More is very similar to what my mentor Peter Drucker did for me. Todd is asking the right questions and providing the right feedback that plays out as encouragement, permission, clarity, and accountability. I enthusiastically did the Epilogue and believe this is an important book that can catalyze fresh expressions in American Christianity." Do you have a desire to experience more abundant and meaningful living? Do you have a sense that you have more capacity for good than what your current roles and responsibilities provide? Are you uncertain of your unique personal calling and how to discover it? If so, More is written to encourage, inspire and equip people like you. This guide is part of a library of supplementary resources to help readers work through and apply the BE-DO-GO process in More. These supplementary resources will continued to be added to the library. 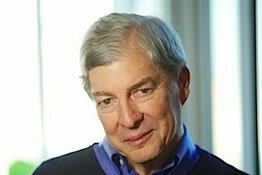 I remember the day my mentor and friend Bob Buford, author of the book Halftime: Moving From Success to Significance, challenged me with the idea of working 100% in the sweet spot of my personal calling. My first reaction was a genuine enthusiasm. How amazing would it be to live perfectly aligned in the sweet spot of God’s unique calling for my life? Bob’s question that day was a turning point in my life. I took the question to heart and became passionate about discovering the sweet spot of my personal calling. Its a journey that will continue the rest of my life. In the process, I developed a simple framework for calling that I now use to help other people find their calling. The book More was a five year labor of love that seeks to capture the framework in words.